SANTA MONICA, CA (May 20, 2014) - Lionsgate (NYSE: LGF), the premier next generation global content leader, will release the electrifying first installment of the blockbuster action adventure franchise Divergent on Blu-ray Combo Pack (plus DVD and Digital HD), DVD (plus Digital), Video on Demand and Pay-Per-View on August 5, the Company announced today. The film will be available on Digital HD two weeks early on July 22. Based on Veronica Roth's #1 New York Times best-selling book series which has sold nearly 22 million copies worldwide, the film features an all-star cast including Shailene Woodley, Theo James, Academy Award(R) winner Kate Winslet and Ashley Judd. To date, Divergent has grossed nearly $150 million at the domestic box office and more than $250 million worldwide in its theatrical release on Lionsgate's Summit Entertainment label, getting the new franchise off to a fast start. The next three installments -- Insurgent and Allegiant Parts 1 & 2 -- will be released theatrically on March 20, 2015, March 18, 2016 and March 24, 2017, respectively. Packed with bonus material, the Blu-ray Combo Pack includes the documentary "Bringing Divergent to Life," an in-depth look at the making of the film plus the exclusive featurette "Faction Before Blood," detailing the film's future world. The Blu-ray Combo Pack and DVD both feature deleted scenes and two audio commentaries - one with director Neil Burger and one with producers Douglas Wick and Lucy Fisher. 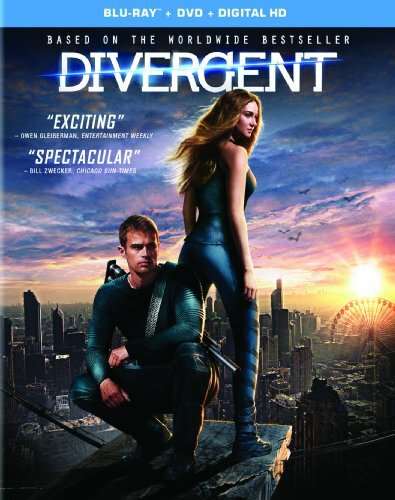 The Divergent Blu-ray Combo Pack will be available for the suggested retail price of $39.99 and the DVD for $29.95. Divergent stars Shailene Woodley (upcoming The Fault in Our Stars), Theo James (Underworld: Awakening), Ashley Judd (Double Jeopardy), Jai Courtney (A Good Day to Die Hard), Ray Stevenson (Thor), Zo� Kravitz (X-Men: First Class), Miles Teller (The Spectacular Now), Tony Goldwyn (TV's "Scandal"), Ansel Elgort (upcoming The Fault in Our Stars), Maggie Q (TV's "Nikita"), Mekhi Phifer (ShowTime's"House of Lies") and Academy Award(R) winner Kate Winslet (Best Actress, The Reader,2008). The film is directed by Neil Burger (The Illusionist, Limitless) from a screenplay by Evan Daugherty (Snow White and the Huntsman) and Vanessa Taylor (HBO's "Game of Thrones"). Divergent is a thrilling action adventure set in a future world where society has been divided into five distinct factions. But Tris will never fit into any one group-she is Divergent, and what makes her different makes her dangerous. Targeted by a faction leader determined to eliminate all Divergents, Tris turns to the one person she believes she can trust: Four, an instructor for the militant Dauntless faction, and a man full of dark secrets. Together, Tris and Four uncover a mind-bending conspiracy that will put their courage to the ultimate test...and forever link their destinies. Its feature film business has been fueled by such recent successes as the blockbuster first two installments of The Hunger Games franchise,The Hunger Games and The Hunger Games: Catching Fire, the first installment of the Divergent franchise,Now You See Me, Kevin Hart: Let Me Explain, Warm Bodies, The Expendables 2, The Possession, Sinister, Roadside Attractions' Mud and Pantelion Films' breakout hit Instructions Not Included, the highest-grossing Spanish-language film ever released in the U.S.